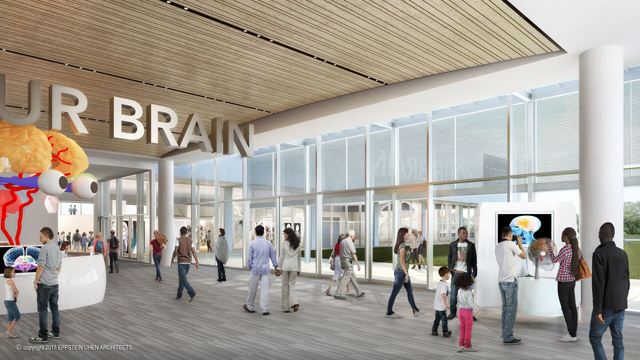 Discovery World announced a major expansion and renovation today that will add nearly 20,000 square feet of public space to the museum, which sits on the lakefront at the foot of Clybourn Avenue. 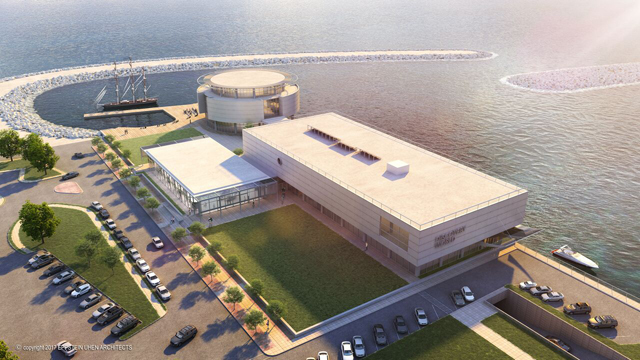 Work on the $18 million addition will begin in October and the official groundbreaking is slated for Tuesday, Oct. 10 at 10 a.m. at Discovery World, 500 N. Harbor Dr. The current Discovery World facility opened in 2006. Phase one of the project is a 10,000-square foot pavilion that will be added to the north side of the current 120,000-square foot building, where there is now a lawn. 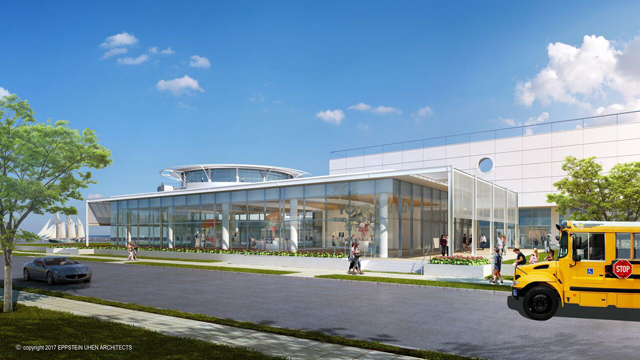 The pavilion will include lunchroom space for visiting school groups, educational space for those groups and for Discovery World's summer camps, exhibition space for large traveling shows (7,500- to 10,000-square feet) and special event space. The project's second phase will double Discovery World's current exhibition and program space by transforming one of the museum's two theaters into a new "Grand Entrance and Exhibit Gallery" and by opening up a back-of-house mezzanine for public use. The spaces will house a pair of new exhibitions, including a 5,000-square foot public health and medical research exhibit highlighting careers in health care. Phase one is expected to be complete by the middle of next year and work on phase two, which is expected to begin before the end of 2017, is slated to wrap up by the end of 2018. The project was designed by Milwaukee's Eppstein Uhen Architects. "Working with our community partners, we have formulated a vision for an exciting and transformational project that will help shape our organization's future for the next 20 years and allow us to have a more significant impact on kids in our community," said Joel Brennan, Discovery World CEO and president, in a statement. "Through these changes, we will be able to provide access to a significantly larger number of visitors and students each year, we will gain additional earned revenue to build and maintain the facility and our programs, and we will be able to deepen our focus on providing STEM (Science, Technology, Engineering and Mathematics) Education for the schools and kids who most need interactive education in our community. "While these exciting investments will make the building more attractive and effective for even the most casual visitor, this investment is about our mission to improve educational outcomes in our community. Because of the versatility and sustainability that this project will provide, our team will be able to deliver even more high-focus programs that immerse students in STEM programs for hours at a time and direct their energy toward real world applications and job skills." The expansion will be funded by private donations from individuals and foundations, including the Reiman Family Foundation, which has provided the lead gift as a catalyst for the expansion. The investments in Discovery World will be funded through private contributions from individuals and foundations. The lead gift for the project funding has been provided by the Reiman Family Foundation; that gift and other commitments will enable the work to get underway in 2017. The full project budget is approximately $18 million, and the fundraising campaign is currently underway to ensure that the work can be completed by the end of 2018. Discovery World hopes the expansion will be able to serve a bigger audience and offer more programming to Milwaukee-area children. Additionally, it estimates that the expansion will help add more than $1 million in revenue, "providing a stronger and brighter future for the organization and enhancing its ability to serve the entire community, even those who cannot afford the price of admission or programs," according to a press release.